Step-by-step instructions with pictures for how to make a flour gravy that’s delicious and has the correct thickness every single time. The ratio of flour to fat to stock is given as well as the method for how to combine everything to make it taste amazing. Making gravy used to be a mystery to me. I’d add flour to my roast’s drippings and maybe some broth or stock. Then season it up, stir it up and simmer it up. Sometimes it would be delicious, thick but not too thick, meaty but not overpowering. Other times, it would taste a bit like flour, water, and salt. Too thin. Just plain not good. I did some research and started making notes about what I was doing. And writing down what worked and what didn’t. 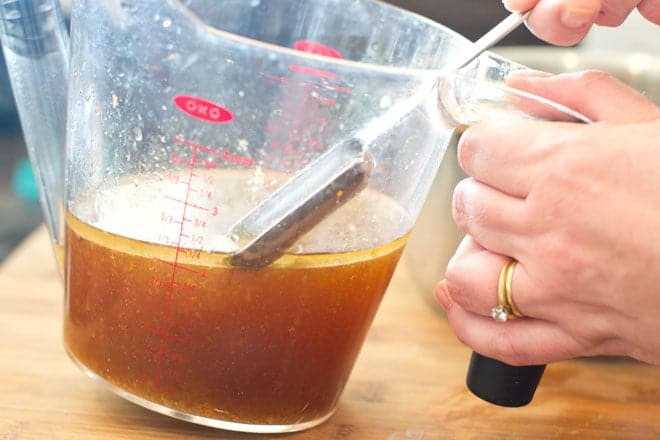 I’m going to tell you the stuff that worked and what led to me being able to make perfect gravy every single time. Plus, I put together this video to show you how quick and easy it really is! Gravy isn’t complicated but if you want to be great at it you need to understand why you’re doing each step. What I’ve done is to put a very lengthy explanation here with pictures and all the info you need. It has the method and also the gravy ratio for how much fat to use with how much flour and how much stock or broth. This post is going to tell you how to make a gravy using flour. All-purpose white flour. You would use a different method if using cornstarch or any other flour as a thickener. If you want to use cornstarch, amounts are given over here in my Instant Pot Gravy recipe. You can make that on the stove in a regular pot though, no special pot required! At the bottom of this post, there’s a much much shorter set of instructions in printable form that you can take into the kitchen with you. If you have any questions, please put them in the comments below. I’m happy to answer and help you make the best gravy of your life, and I hope you’ll then keep making it for the rest of your life. It’s easy once you’ve got it down. Promise. 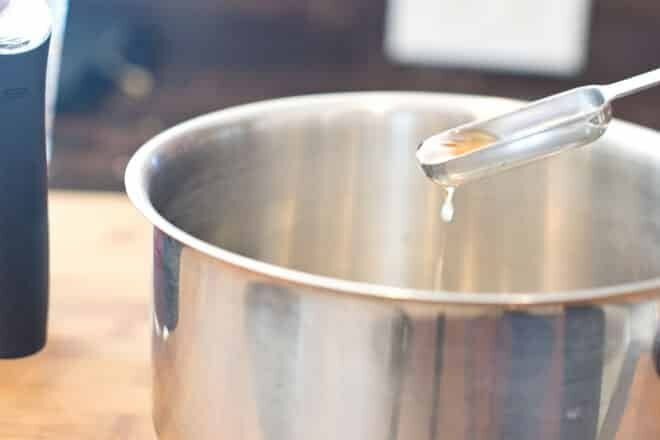 Drippings are the liquid (fat and juices) that pool at the bottom of your roasting pan when you cook a large piece of meat or poultry. The thing is, sometimes you don’t get a lot (or any) drippings. So I’ve found a way to get nice concentrated meat juices no matter what. (Side Note: It is totally possible to make gravy without drippings if you, for instance, are a vegetarian or aren’t making a roast but want gravy anyhow. The method is a bit different but the results are great. 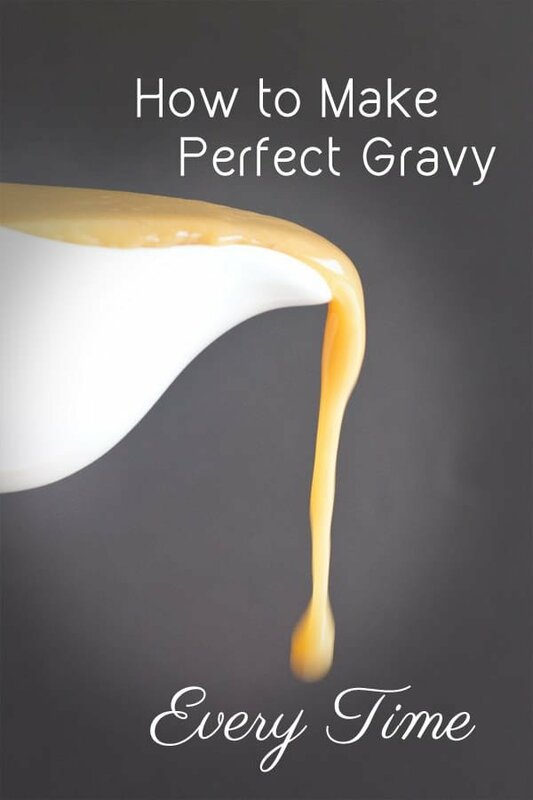 Learn how to make gravy without drippings here). To make sure that I have lots of good drippings, even from a small roast, I put unsalted store-bought broth in the bottom of the roasting pan while the roast cooks. Just a quarter of an inch or so. I first explained how and why to do this when I did the instructions for How to Roast Pork Perfectly over here. But basically, that broth evaporates as the roast cooks. As it does, some of the broth is left on the sides and bottoms of the pan. Those bits caramelize there. Midway through roasting, add more liquid and it will wash those caramelized bits into your juices making them more delicious. Also, by putting broth in the bottom of the pan I counteract something that can happen with roasts. Sometimes you get nice juices coming off of the roast. Other times, not as much. When there’s less they can sometimes burn a bit on the bottom of the pan. A mild caramelization of juices is fantastic. But too much and your drippings will taste burnt and then so will your gravy. Having the broth in the bottom of the pan stops the possibility of burning. Instead, juices that fall from the roast drop into the broth and mix in there. 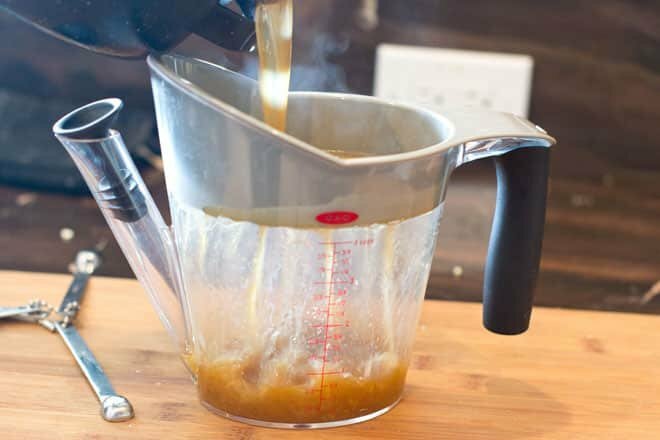 Pour all the juices from the roasting pan into a gravy separator. This is like a measuring cup with a long spout that goes right to the bottom of the cup. The fat of your drippings will rise to the top and the tasty juices will stay at the bottom. You need to get all of the flavor out of the roasting pan. I use a spatula to make sure I’m getting all the browned bits and then anything else from the bottom of the pan. Unlike a lot of people, I don’t make my gravy right in the roasting pan. I find that it’s too big and is harder to incorporate the ingredients. Instead, just use that spatula like I said and make sure you get all the goodness out. 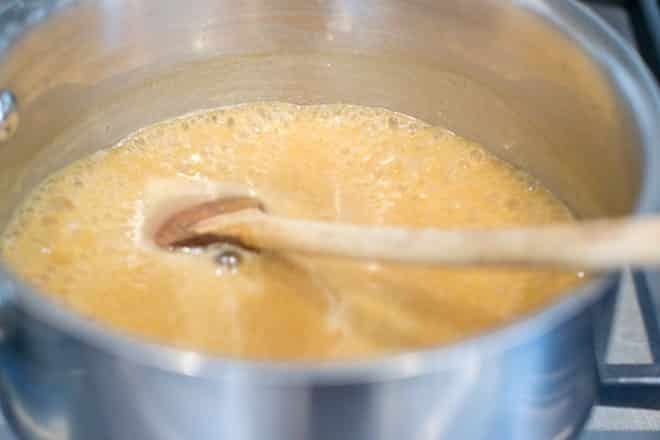 After using the spatula, if there’s a lot of nice caramelization on the roasting pan, pour some wine or water (1/2 cup should do) in there and bring it to a simmer, stirring around and then add that to the juices in your gravy separator. 1.5 tablespoons fat to 1.5 tablespoons flour to 1 cup liquid, which yields 1 cup of gravy. (Note: If you like your gravy thicker, go with 2 tablespoons of fat and 2 tablespoons of flour to 1 cup of liquid, which yields 1 cup of gravy). What you do is decide how many servings of gravy you need and then work from that towards the above ratio to get your amounts. You’ll want 1/3 – 1/2 of a cup of gravy per person. So if you need 6 servings then you want 2-3 cups. I tend to go with the higher amount because I like leftover gravy. 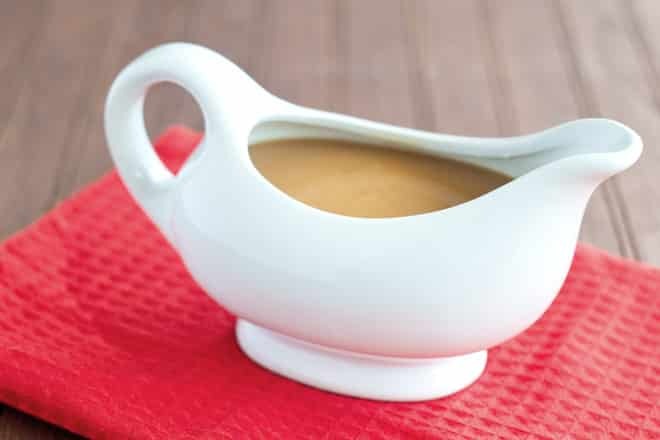 (For ideas of what to do with leftover gravy, check this out!). But probably most people can go with the smaller amount. 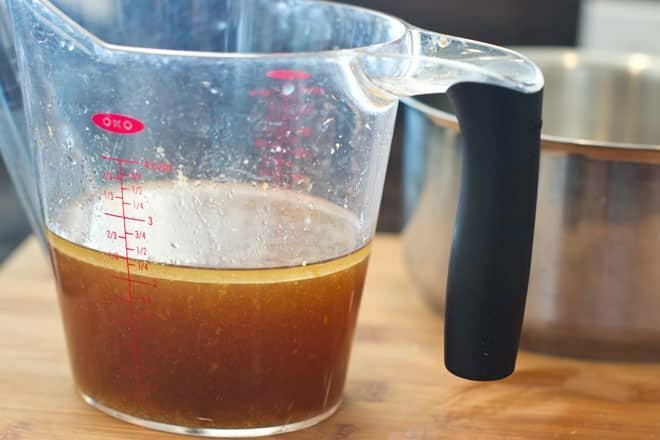 Now that we’ve used our gravy ratio to get our measurements, we can make our roux gravy. 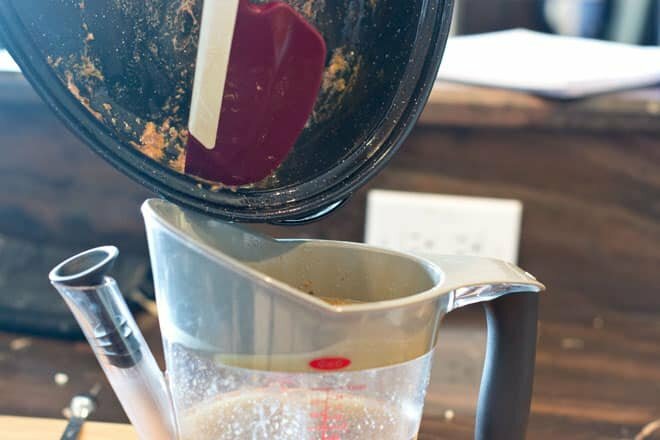 Use a measuring spoon to scoop the right amount of fat from the top of the gravy separator. Pour the fat into a medium saucepan. 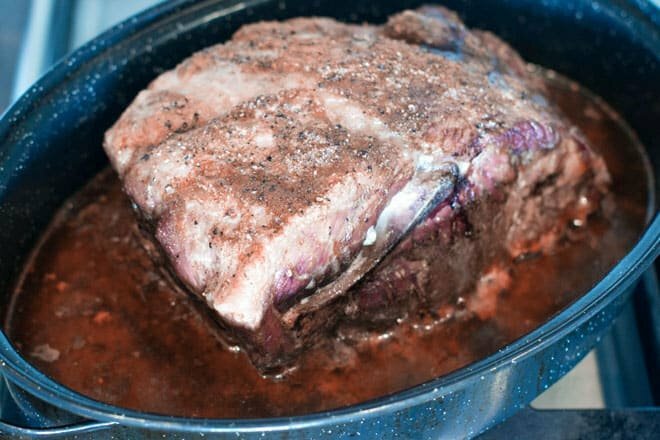 Using the fat from the roast instantly give your gravy extra roast flavor. If you don’t have that much fat on the top of your gravy separator, or if you don’t really like this idea, go with unsalted butter. Put the butter in the medium saucepan and melt it over low heat. Then remove it from the heat and proceed with the below. Add the same amount of flour to the saucepan as you have fat (we’re going with 4.5 tablespoons of each for 6 people). Note: The following is NOT happening over the heat. You do this part at the counter. 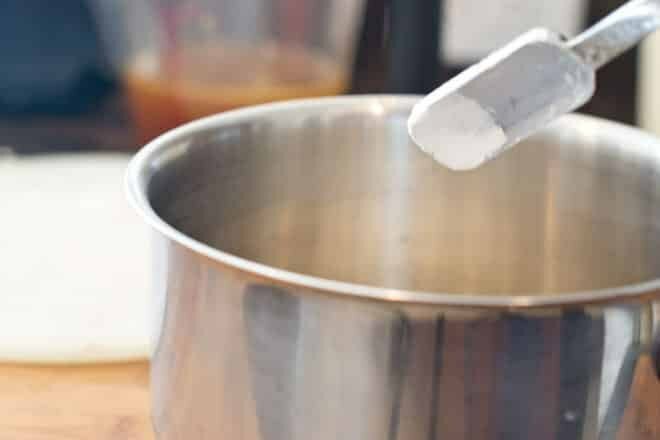 Whisk the fat and flour together into a paste. I really like using a flat whisk like this because it gets right into the edges of the saucepan. It’s one of my favorite tools in the world for all kinds of things, but especially for making gravies and sauces. (FYI, the paste you just made is called a roux. 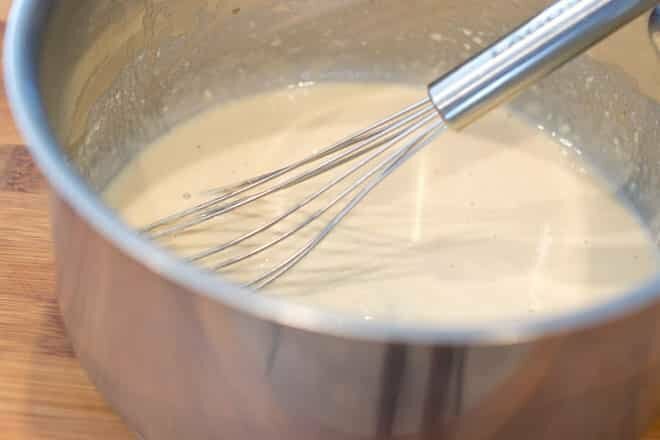 You can use a roux like this as a base for all kinds of sauces and soups). Before you add any of the drippings to your roux, taste them. Sometimes a lot of salt or other seasoning from the outside of the roast gets washed off into your drippings. If they’re really salty, you need to know that before you add them to the gravy. Pour a little into a bowl and slurp. They should be meaty and flavorful but not salty. If your drippings taste great, proceed with step #7 below. If not, pour them into a large bowl, leaving the fat in the gravy separator (you don’t need this fat anymore. Discard it or save it for another use). To the liquid in the bowl, add unsalted store-bought broth or stock. 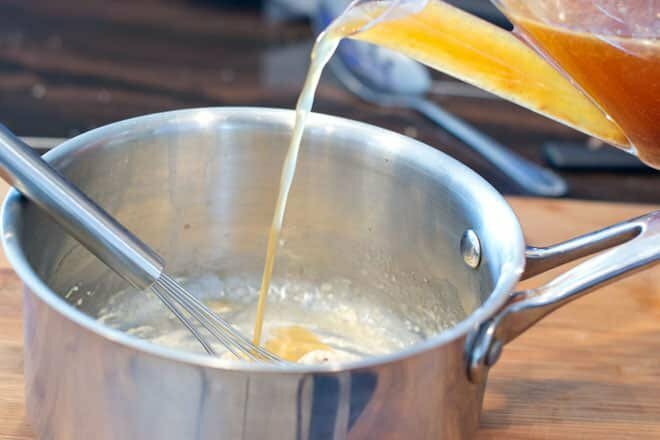 If you’re making chicken, pork or veal gravy, use chicken broth. For beef gravy, use beef broth. You can instead use water or wine. Just make sure you’re not diluting the meaty flavor too much. If the meat flavor is very intense, water and wine will be great. If it’s less intense, you need that broth. Keep adding broth, stirring and tasting until your liquid has a nice unsalty flavor. 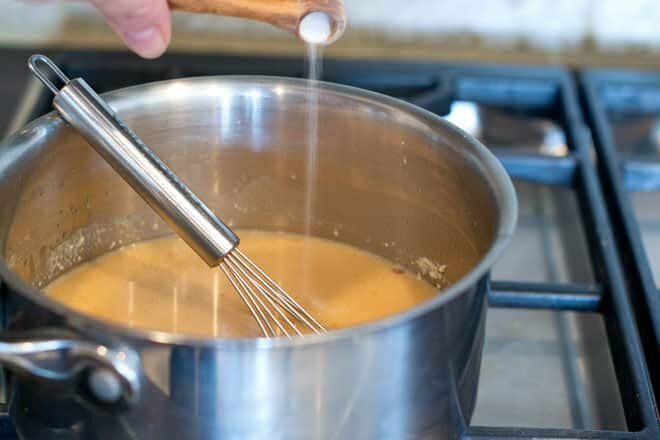 Whisk about one-sixth of your liquid into your butter and flour roux. You want a nice smooth paste. Pour in a bit more and whisk it some more. You want it to be smooth after each addition. Do it a couple more times. Then you can go ahead and slowly stream in the rest of the liquid, whisking the entire time to make sure you don’t have any lumps. (If there are a few lumps, don’t worry. We’ll be straining it later). Once all of the liquid is in and it’s whisked and smooth, put the saucepan over medium-high heat. Stir often until it comes up to a boil. Reduce heat to low and simmer for a minute or two. Taste the gravy. What you want now is to check for seasonings. It might need a little salt and pepper. Add small amounts at a time because it can get salty quickly. I also add poultry seasoning to chicken and pork gravies. Or whatever seasoning I put on the roast. I don’t like to add much though (about 1/4 teaspoon to 3 cups gravy). I like the gravy to taste rich and meaty. I don’t want it to cover up the flavor of the other foods on my plate. OK, one last step, and it’s optional. For reasons I don’t understand, some people love lumpy gravy. Well, maybe I do get it. I also like bits and pieces of tasty stuff floating in my gravy, though not so much lumps of flour. Whatever. Anyhow, if it’s just for us, I skip this. If it’s for company, I do it. 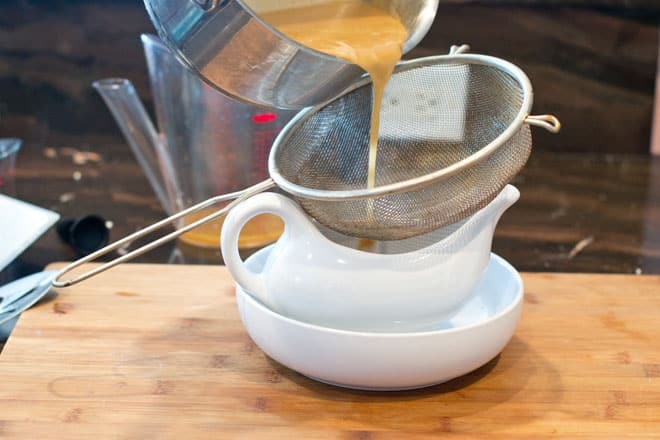 I sit a fine mesh sieve over my gravy boat and strain the gravy in (if you’re worried about making a big mess getting it through there, strain it into a large bowl and then pour it into your gravy boat). There you have it. That’s how to make a flour gravy using a roux perfectly, each and every time. Whisk in 1/2 cup drippings until smooth. Whisk in another half cup. Repeat until all drippings are used. Bring to a boil over medium-high heat. Reduce heat to low and simmer 1 minute. Taste and add salt, pepper, and seasonings. Strain through a fine-mesh sieve. Serve warm. This recipe is for 6 servings. See step #4 above if you need more or fewer servings. Calculations are given there for how much fat, flour, and liquid you need per person. Disclosure: This post contains Amazon affiliate links. If you click on one and then buy something, at no additional cost to you, I receive a small commission. All opinions are truthful and my own. This post originally appeared in November, 2015 and was revised and republished in November, 2018.